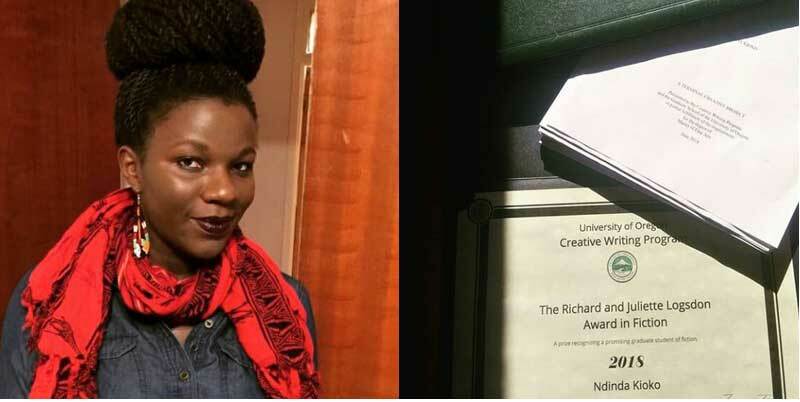 Ndinda Kioko wins Richard and Juliette Logsdon Fiction Award 2018. Ndinda Kioko wins Logsdon Fiction Award 2018. Ndinda Kioko is the winner of the Logsdon Fiction Award 2018. The Award is given to a student leaving the University of Oregon Creative Writing Program. The Richard and Juliette Logsdon Fiction Award is awarded to a student ending their Master of Fine Arts (MFA) at the University of Oregon for work of exceptional merit. Richard Logsdon was Senior Editor for Red Rock Review, a literary journal published by the College of Southern Nevada that features works by poets and short story writers—both new and established. In that position, he met then UO professors Ehud Havazelet (fiction), Dorianne Laux (poetry), and visiting poet Joe Millar. Inspired by them, he decided to sponsor a scholarship for the Creative Writing Program. Since there was already a poetry prize (the Miriam McFall Starlin Poetry Prize) but no existing prizes in fiction, he chose to designate the Logsdon Scholarship as a fiction prize. The newest recipient of the prize is Kenyan writer Ndinda Kioko for her short story, Little Jamaica. The writer was announced at a ceremony on June 11, 2018. It’s been a good few months for the Kenyan as she also recently won the Wasafiri Fiction Prize in October last year. Previous Previous post: Chimamanda Ngozi Adichie awarded PEN Pinter Prize 2018. Next Next post: Nnedi Okorafor’s “Lagune” wins Germany’s Kurd Laßwitz Preis 2017.